If you work in a company handling numerous customers, customer insight is an important part of your work. Customer segmentation of a way that helps to personalize approach to customers even if there are many of them. Identifying customer segment and profiles is a tool not to treat all clients as the same. Because we are not the same. We differ by age, interests, value, purchase frequency. Download a commercial use version of Customer Profile People Silhouettes. To help you visualize different segments, we created a presentation illustrating how you can present various segments using various avatars, colors, assigning them labels. I saw companies using various segmentation approaches. Some pretty simple – only based on customer demographics such as age or country. Some more complex, e.g. RFM based segments, based on purchase Recency, Frequency or Monetary value. Or name the segments by the importance of a client (VIP, Gold segment, Silver, Bronze…). And some pretty sophisticated segmentations – using also predictive customer lifetime value or some statistical scores for each customer. For that, you usually need more advanced analytics, but it can be worth it. Especially if you have thousands of customers and you want to treat them personally. 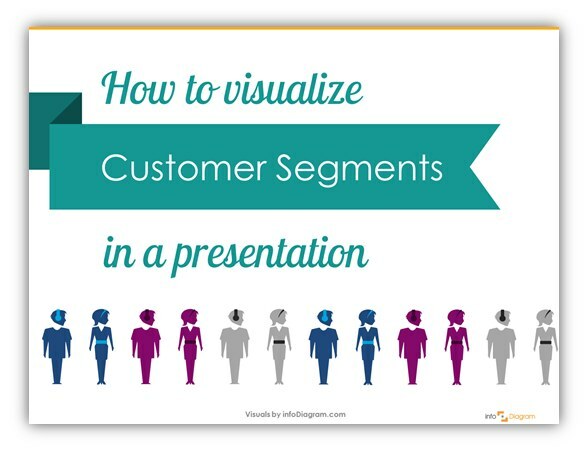 In the case of presenting the segments, for market analysis or sales strategy, it’s good to visualize each segment. If you have a separate icon for each client profile – that’s great. Additionally, if you have editable vector icons, you can recolor them for each segment. Have a suggestion for a new segmentation graphics? Let me know. Want to be notified when we make an announcement? Never miss out on creative presentation graphics and stay informed about our latest updates and news. We’ll also send you a Creative slide design guide with FREE hand drawn shapes for you to begin using right away!